As the New Year approaches, I figured that the Miami Dolphins need to have some resolutions of their own for 2011. The Dolphins aren't that far away from being a playoff team. It may be hard to believe because of their record this year, but Miami has a lot of talent that was masked by a few poor performers. So, without further ado, here are the two most important New Year's Resolutions for the Miami Dolphins in 2011. At the beginning of this year the majority of Dolphins fans were expecting Henne to be the future of the Miami Dolphins franchise, and I was one of those fans. Instead, Henne has been really bad, and hasn't even been able to manage games this season. Now, Miami must try and find a new quarterback for next season who is able to (at a minimum) manage games and (hopefully) make big plays consistently. There are a few prospects in the draft that the Dolphins might have a shot at getting like Ryan Mallett and Cam Newton, and that is where I would prefer them to look first. It is also possible that they could look into the free agent pool. Players like Kevin Kolb and Kyle Orton may be available, and I think both of those players could be really good in the Dolphins offense. It is extremely necessary for Miami to find a new quarterback because Chad Henne just isn't cutting it anymore. Instead of being the reason that his team wins like a quarterback is supposed to be, Henne has been the reason the Dolphins have been losing. There have not been any indications out of Miami about what they will do about our quarterback, but we all need to pray that they don't decide to stay with Henne as the starter. Anyone who has followed the Miami Dolphins at all this season would have been able to guess that I would suggest they get rid of their Offensive Coordinator Dan Henning. His play calling was the stupidest and easiest to read in the NFL. Miami's offense was so simple and pathetic that defenders were able to guess what routes receivers were running before the play even started. Dan Henning has just been bad all year, and it gets pretty old complaining about him, but I don't have a choice because he always seems to be part of the problem. Possible replacements that have been revealed are Current Texans Head Coach Gary Kubiak and ex-Broncos Head Coach Josh McDaniels. Both could be very good choices for the job, but first Miami must fire Henning. There have been indications this week that Henning would be fired at the end of the season, so I am not worried about the fact that he will be here next year. Thanks for reading, and let me know some of the other resolutions you think the Dolphins must fulfill to be successful next year. Miami Dolphins owner Stephen Ross has apparently been convinced by Bill Parcells to allow Tony Sparano to keep his job, and Miami's star WR Brandon Marshall has also said that he wants Ross to keep Sparano as head coach. Both votes of confidence have come in a very timely manner for Tony, with rumors that Sparano may be fired circling the web and Bill Cowher eying the Dolphins job next year. I doubt that Stephen Ross is going to fire Tony now after his star wide receiver (Marshall) and one of the main architects of his team (Parcells) have expressed their support for Sparano. And, the more I think about Tony Sparano staying, the more that I like the idea. Tony Sparano wasn't the reason Miami's offense has been bad thus far, QB Chad Henne and Offensive Coordinator Dan Henning have. I know that there are a lot of you that wanted Miami to go and try to hire Bill Cowher, and I did too, but after thinking about it I can't help but feel excited that the Dolphins are going to keep Sparano. He has done a lot with the Miami Dolphins, and he has been able to bring in a lot of talent to the organization. Miami is just a good quarterback and an offensive coordinator away from making a deep run into the playoffs, and I think Stephen Ross realizes that, thus his willingness to keep Tony. It is also likely that the Dolphins will be replacing Dan Henning at the end of the year. The possible candidates that have been revealed are Gary Kubiak, who is currently the Houston Texans Head Coach, and Josh McDaniels, who was recently fired from the Broncos head-coaching job. I don't know if I favor bringing Josh McDaniels in because of his past history with Brandon Marshall, but it may actually work. When Marshall played under McDaniels he had his 21 reception game and a 100 receptions season, and he was one of the best receivers in the league. So, if Brandon and Josh are able to coexist, it might be worth bringing McDaniels in. The decision to keep Sparano has not been announced officially yet, but don't be surprised if it comes soon. I have a feeling that when it does, though, it will either follow or be followed by news of Dan Henning's release or retirement. Thanks for reading, and I am always open to comments. I will talk to you guys again tomorrow. Cameron Wake And Jake Long Of The Miami Dolphins Are Named To The Pro Bowl, But What About Vontae Davis? The Pro Bowl rosters have been announced, and the Miami Dolphins have two players that will be traveling to the 2011 Pro Bowl in Hawaii: LT Jake Long and OLB Cameron Wake. Both have been named starters, and I am very pleased that they were recognized for their ability. I was a little bit worried that Cameron Wake wouldn't make the Pro Bowl because he isn't as well known as some other players, but more people are aware of his talents than I thought as he was named a starter. The thing that makes me mad is the fact that Dolphins CB Vontae Davis wasn't selected for the Pro Bowl. Vontae is an extremely talented corner that has hardly been beaten at all this year. He has shut down almost every single receiver he has covered this year, and that includes the top-notch ones. What makes me even madder is that Jets CB Darrelle Revis made the Pro Bowl solely on name recognition. If he hadn't had such a "great" year last year, he wouldn't have even been considered for the Pro Bowl. Voters just saw somebody who they knew was good enough to be in the Pro Bowl at one point, so they voted for him even if he wasn't playing as well has he had in the past. This case is similar to when Brett Favre was voted into the Pro Bowl when he was with the Jets. He didn't deserve at all to be playing in the All Star game with his performance that year, but everybody knew who he was, so they voted for him. I will admit that Darrelle Revis' case isn't as severe as Favre's when it comes to making the game solely from name recognition, but it is still a similar case. There are always a bunch of Dolphins players that I would love to be in the Pro Bowl, but I don't really think they deserve it. I do think Vontae deserves it, though, and I believe the voters really missed on not selecting him. Thanks for reading, and let me know what other Dolphins you think the Pro Bowl voters should have selected for the trip to Hawaii. It's time for "You Tell Me" Tuesday. Today's question is, would you rather the Miami Dolphins keep Tony Sparano as the head coach of the team, or would you rather they go after Bill Cowher and fire Sparano? Like always, I won't influence your opinions at all. Just leave a comment with exactly what you want Miami to do and what you think they will do. A few weeks ago Miami Dolphins Head Coach Tony Sparano was not on the hot seat. Instead, he was sitting safely in the head coaches "seat" without having to worry about losing his job. Now, Bill Cowher has shown interest in the Dolphins head-coaching job, and because of poor performance and poor decisions, Sparano doesn't seem very safe anymore. The Miami Dolphins have lost their last two games to two very bad teams: the Buffalo Bills and Detroit Lions. Buffalo and Detroit have a combined record of 9-21, or .300, which is pathetic. The loss isn't necessarily Tony Sparano's fault, but the head coach has to be somewhat responsible for two losses against teams like the Lions and Bills. I can live with the losses, though. In my mind, Miami was already out of the playoffs before they lost to Buffalo. I wasn't that mad when the Dolphins lost these last two weeks. What Tony Sparano has done that I don't like is that he has kept Chad Henne in as starting quarterback. It amazes me that he doesn't yet realize that Chad Henne is not the quarterback everyone wanted him to be. Instead of giving Tyler Thigpen a chance to see if he is a capable starter, Sparano has been stubborn and kept Henne in. Week after week, Henne has proved that he isn't capable of winning games, and it has resulted in (you guessed it) losses. Thigpen didn't have the greatest game when he started against the Bears, but that wasn't as much his fault as it was because of a beaten-up offensive line. I have never before complained about Tony Sparano in this blog, but now I have no choice but to. He is being way too stubborn by keeping Henne in, and if he can't realize that Chad Henne isn't an NFL quarterback, then it is hard to want him as the head coach of my favorite team. I am not calling for Sparano to be fired. I think he is doing a fine job. What has killed the Dolphins this year is poor play calling by Dan Henning and poor quarterback play by Chad Henne. Sparano does not come out squeaky clean from both of their mistakes, though. He is the head coach, and ultimately he should be making the final decisions. Yes, Dan Henning is calling the wrong plays, but why didn't Sparano step in and stop some of them. Let me reiterate, I do not think Tony Sparano should be fired. I would love for the Miami Dolphins to go after Bill Cowher, but I wouldn't mind at all if Stephen Ross decided to keep Tony. Thanks for reading, and let me hear what you think. Save some of your opinions for tomorrow evening, though, because I think the "You Tell Me" will be about Miami's head coaching job. I have no problem with Chad Henne as a person. From what I can tell he is a very hard-working person, and I respect that. In fact, a good work ethic is one of the most important things for a professional athlete. What I do have a problem with, though, is his abilities as a quarterback. His decision-making and poor accuracy kill drive after drive, and I have had enough. It is time to finally bench Chad Henne. I think it is fitting that Chad Henne's last start with the Miami Dolphins (which is what I expect this game will be for him) ends with him costing Miami the game with two late interceptions. I am not going to take a long time saying why Chad Henne should be benched because you guys already know why. This loss moves Miami closer to picking a better quarterback in the draft, which is why I'm not that frustrated with it. Thanks for reading, and if you feel so inclined, please leave a comment with your own personal letter to Chad Henne. I look forward to reading your letter. Merry Christmas From Dolphin Shout! I will not be posting tomorrow for Christmas, so I will get back to you guys on Sunday for the game. Everyone enjoy your break from work and whatever else you won't have to worry about tomorrow, and I will talk to you guys on the 26th. You Tell Me: Should The Miami Dolphins Draft A New QB, Trade For A New QB, Or Keep Chad Henne? I am starting a new series on Dolphin Shout. It will be called "You Tell Me", and after today's post I will move it to every Tuesday. All I am going to do is ask a question, and I want to hear your reaction with a comment. I did a "You Tell Me" post recently, and the reaction was more than any other article I have ever written, so I am going to do it more often. The key to "You Tell Me" is that I don't post my own opinion in the article. That is because I don't want to influence what you say. I want to hear what you have to say, and then I will react to your comments with comments of my own. What should the Miami Dolphins do with their quarterback situation? Should they keep Chad Henne, trade for a new one, or draft one in the 2011 Draft? Also, what do you think the Dolphins will actually do? We can talk all we want, but it will come down to what Miami actually does. So, let me hear it. I will be reading every comment, and I will be adding my input whenever necessary. Ronnie Brown Would Like To Stay With The Miami Dolphins, But Can He? Miami Dolphins running back Ronnie Brown told the Miami Herald that he would like to stay with the Dolphins after his contract ends this year. While I am not sure that the Dolphins are going to want to bring Brown in, I think it would be a good idea for them to. I know a few weeks ago I said that I thought Miami should get rid of Brown, but now that I think about it, he could still be a great running back. The only catch to that is that he will be a great #2 running back. The Dolphins need a premiere #1 back who is capable of putting up big numbers every week, and Brown doesn't seem to be able to do that anymore. I wish he could, but he hasn't seemed to be able to anymore. I am not saying that I want the Miami Dolphins to go and get a running back in the first round of the draft, though, because I want them to go after the quarterback then. Maybe they could pick up a lot of backs in the later rounds and hope for a diamond in the rough, or they could trade for a good one from another team. I am afraid that there is a good chance that they will keep Brown as the #1 back still, though. Miami's running game has been hurting this year, but replacing our running back is not as necessary as replacing our quarterback, which is why I think the Dolphins may end up resigning Brown even if they want to go after a better back in the draft. It is also likely that Ronnie will be willing to take a pay cut to come back to South Florida. Brown has lived in Miami since he was drafted in 2005, and he loves it there, so I wouldn't be surprised to see him take a smaller salary than what he would be able to get somewhere else. As always, we will see what happens, and please feel free to leave a comment. Could Mike Be Leaving The Dolphins? I know just yesterday I posted that the Miami Dolphins might want to go after Bill Cowher, and I still think that he would be a great coach for Miami, but there is another coaching rumor surrounding the Dolphins that would probably end up hurting them if it comes into fruition. That rumor in Miami is that Defensive Coordinator Mike Nolan may be taking a Head Coaching job with another team for next year. Two possible candidates for Nolan to coach are the Broncos and Texans, and I wouldn't be surprised if he goes to either team. It would be a no-brainer for Nolan personally to move up to a Head Coaching job, which is why I have a feeling that he won't be a Dolphin next year. I see no reason for him to stay in Miami when he can get a better job with another team if that team wants him. Every football coach dreams of an NFL job, and he has earned the chance to take it. While moving up to head coach would be great for Mike Nolan, losing him would be terrible for the Miami Dolphins. Miami's biggest strength has been their defense, which, thanks to Nolan, has been superb this season. I am not sure how much of the Dolphins defensive success is due to Nolan's efforts and how much of it is due to the players, but I get the feeling he has had a pretty big influence. I still think the defense can be good, but I don't know how good they can be without Nolan. He was able to transform last year's pathetic passing defense into one of the best in the league this year, so I am not surprised at all that he might be leaving. I just wish it didn't have to happen. On another note, I have heard a few people suggest that the Dolphins should bring in Josh McDaniels as the offensive coordinator to replace Dan Henning, who is, most likely, going to either retire or be fired from the Dolphins at the end of this season. I wanted to say that bringing in McDaniels would be a huge mistake simply because of Brandon Marshall. Marshall was mad at the Broncos last off season partly because of McDaniels, so it would only bring back bad memories if the Dolphins hired McDaniels. That's all for now, and please be sure to check back soon. I look forward to reading your comments. Bill Cowher has released a three team list of NFL teams that he would like to coach for, and the Miami Dolphins are one of those three teams. Now, before you say that Dolphins Head Coach Tony Sparano is not the reason for Miami's unsuccessful season, I want you to know that I agree with you. I believe that Sparano is a great coach, and the Dolphins can still do really well with him at the helm. It is also my impression that Dolphins Owner Stephen Ross feels pretty much the same way that I do and he is confident in Sparano's abilities. With that being said, there were rumors earlier this year that Stephen Ross was eying a big-name coach like Jon Gruden to come in and coach the Miami Dolphins. It was a very small rumor, and I haven't heard anything else about it since, but it is a possibility nonetheless, and because there is a small indication that Stephen Ross isn't 100% behind Tony Sparano, I have to consider the chances that Miami might go after a big-name coach like Bill Cowher. Stephen Ross wants a successful team now. He expected the Dolphins to be Super Bowl contenders this year, so I wouldn't be surprised if he makes a high profile move like bringing Cowher in. Bill Cowher has won a Super Bowl before, and if Ross feels like I do(that the Dolphins have enough talent[with the exception of Chad Henne] to be a Super Bowl contender), then I wouldn't be very surprised if he tries to bring in a coach who has already been "there" to utilize that talent in a way that worked for him before. The fact that Bill Cowher expressed interest in the Miami Dolphins Head Coaching position just reinforces my point about the talent Miami already has. Cowher named only three teams that he was interested in, which means that those three teams are good enough that he is willing to come out of retirement for and coach. Notice how he doesn't want to coach for a team like the Vikings or Panthers. Instead, he wants a team that already has a lot of pieces in place. The other two teams on his wish list are the Giants and Texans. The Giants are obviously talented, with a 9-5 record, and the Texans have a lot of talent that has been wasted this year with a 5-9 record. Cowher expressing his interest may just be too much for Stephen Ross to pass up on. He likes to bring in big names, and Bill Cowher is a big name NFL coach. I can't say which coach I would rather have right now, though. To me it seems like a win-win situation. The Dolphins either get a great coach who knows the players and gets along with them well in Tony Sparano, or they get a Super Bowl-winning coach who sees a lot of potential in who they have right now in Bill Cowher. I wouldn't be surprised if we hear something within the next week from Ross about Cowher's status even though we are still in the regular season, so stay tuned. Do you think Cowher would be a good fit in Miami? Let me know with your comments. Surprisingly, Chad Henne wasn't the reason the Miami Dolphins lost this week's game against the Buffalo Bills. This time it was Dan Carpenter's fault. Carpenter missed four field goals from long distances to cut the string that was holding up the Miami Dolphins slim playoff chances. The Dolphins are officially out of the playoffs with this loss, and now they can begin focusing on what changes need to be made during the off-season to play better next year. Dan Henning didn't have the best play calling, but he wasn't terrible. There were a few times where I questioned what the offense did, but it wasn't nearly as bad as it has been in past games this season. Chad Henne actually played well enough to beat a team like the Bills. He wasn't anything spectacular, but he didn't cost Miami the game like I thought he would. I still don't think he should be the starter because he isn't able to beat a team like the Bills on his own, but that is just my opinion. Brandon Marshall also had a good game, with 11 receptions for 106 yards and a touchdown. I guess it is still possible for him to reach 100 receptions for the season, but he needs to get 29 receptions in two games. He has had 22 receptions in a game before, so it isn't beyond the realm of possibility. It still isn't likely, though. I can honestly say that I am happy Miami lost this game. Each loss gives them a higher pick in the NFL Draft, and hopefully puts the Dolphins closer to drafting a top-tier quarterback. Thanks for reading, and I will talk to you guys again tomorrow. Yes, my first prediction this year where I don't think the Miami Dolphins are going to win. I just don't believe Chad Henne is capable of winning. Nothing on the offense is working, and I have a feeling that a couple of costly interceptions will allow the Bills to score. Let me know in the comments with your predictions. I know I'm not. His replacement, Cameron Wake has been just as good as Porter (if not better), and he has a good shot at passing Porter's sack mark of 17.5 from the 2008 season. Wake currently has 14 sacks, and the Dolphins have three more games left to play. That means he only needs 3.5 sacks in three games, which is a very manageable feat considering he had two sacks in less than a minute against the Jets last week. Wake is leading the NFL in sacks, with 1.5 more than second place Clay Matthews. Matthews has gotten more "attention" for his play this year, though, but people are starting to realize how good Wake really is. Despite his enormous skills, most people outside of Miami had never heard of Wake until recently. He showed people how good he was in Canada for the CFL, but the Dolphins didn't give him a chance to do much of anything as a rookie last year. Because of his limited playing time as a rookie, most people hadn't heard of him, but more and more people are starting to know him now that he is playing so well. Wake has been a huge part of the Miami Dolphins defense, too. His statistics aren't just empty numbers. A lot of his sacks have been crucial in helping the Dolphins winning. Just last week against the Jets, he sacked Mark Sanchez twice on their final drive, and helped Miami seal the win. We don't know what would have happened if Wake wasn't able to get to Sanchez, but I am glad we will never have to find out. If you look back to the Dolphins Week 2 game against the Vikings, Miami might not have won if Cameron Wake didn't force a Brett Favre fumble in the end zone for Koa Misi to recover for a touchdown. All I am saying is that the Miami Dolphins better reward Wake with a big, fat contract. He has earned it, and I would hate for the Dolphins to have to ever face Wake in the future. 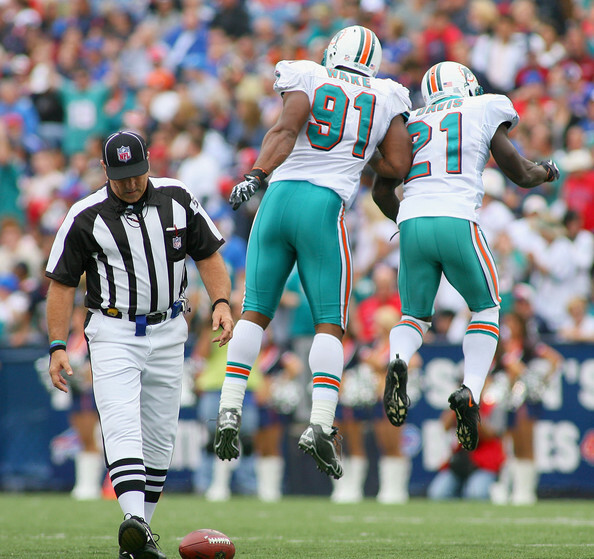 Thanks for reading, and give Cameron Wake a little love with your comments. Why Do I Get The Feeling The Miami Dolphins Will Lose This Week To The Buffalo Bills? The Miami Dolphins always seem to play down to weaker opponents. Instead of performing consistently, they are always up and down, and they can't ever seem to keep a streak going. One week after it appeared that Miami's offense was finally coming around after their win against the Raiders, they lost to the Cleveland Browns in a pathetic offensive showing. They were unable to win after the Raiders game, and I don't think they will be able to win after the Jets game, either. Since Miami's Week 5 bye, they haven't had two losses or two wins in a row, and the only time they have won two games in a row all season was during Weeks 1 and 2. If that trend continues, then they will lose to the Buffalo Bills this Sunday. Don't dismiss the possibility of losing to Buffalo, either. Chad Henne made the Cleveland Browns defense look like one of the best with his poor play, and it is very, very possible that he will do the same thing to the Bills. Most people don't know it (and I didn't either until recently), but the Bills have allowed the 4th lowest passing yards in the NFL. That's better than the Jets, and the Jets were able to hold Henne to 55 passing yards last week. I believe that much of that inconsistency is due to Chad Henne's performance, and until he is gone I don't see the Dolphins getting any better. Henne just can't be a consistent quarterback, and that is a big reason why I have been calling for his benching for a couple weeks now. We'll see what happens, but I don't have a good feeling about this game. In all honesty, though, I won't mind if we lose because we can get a better draft pick. Thanks for reading, and let me know what you think. Should We Complain About The Dropped Balls By The Miami Dolphins Secondary? The Miami Dolphins defense has been superb this year. Mike Nolan has completely transformed them into one of the best defenses in the league, and without them the Miami Dolphins would be way below .500 right now. Nolan really has done a superb job with the team, and thanks to him we don't have to rely on Chad Henne or Dan Henning's play calling as much. Miami's defense has kept games close and hasn't allowed teams to pull away when their offense wasn't scoring. My only complaint about the Dolphins defense, though, has been their inability to catch the ball for interceptions. Miami's defense has probably had a minimum of 15 chances for interceptions that they just dropped. The ball has been in the hands of the Dolphins defense countless times, they just haven't been able to hold on to it. I am grateful for the defense's ability to get in the way of the pass, don't get me wrong, it is just frustrating to see opportunities like that to go to waste. I can think of four different times where if one of the Miami defenders were able to catch the ball they would have had an easy touchdown. Sean Smith (my favorite Dolphins defender) has probably been the worst about it. He has done a great job of getting in front of the pass, but he just can't hang on to the ball when it reaches him. In the Jets game alone, if I am not mistaken, Smith had at least seven different chances to intercept a pass that he didn't capitalize on. He batted the ball down every time, which is good, but he couldn't bring it in for a pick. As frustrating as it is to me to watch the pass after pass dropped by a Dolphins defender, I still can't really complain. Miami's secondary is doing an excellent job of keeping the offense from catching the ball. There have been cases where inability to catch the ball on defense had a bad result. For example, Chris Clemons had a chance to intercept a Carson Palmer pass earlier this year, but instead he couldn't hold on to it and ended up hitting it into the air where Terrell Owens caught it for a touchdown. Those cases are rare, though, and until they start happening with any regularity I won't complain. I'm just thinking that the Miami Dolphins are still feeling the effects of Ted Ginn Jr. He always dropped the ball, and it must have started to rub off on the defense. Thanks for reading, and let me know what you think about the butterfinger defense. 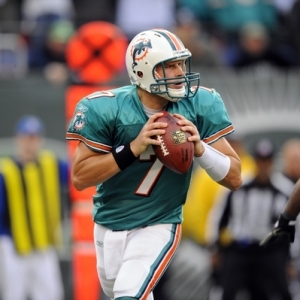 You Tell Me: Who Hurts The Miami Dolphins Offense More: Chad Henne or Dan Henning? I want to leave this discussion completely up to you, my readers. I can only say my own opinions about Dan Henning and Chad Henne so many times before it gets old. I want to know who you guys believe hurts the Miami Dolphins more: Henne or Henning? I am not going to throw my opinion in there because I want to see your immediate thoughts about each. My opinion would just guide your thoughts, and I want to hear your personal opinion without me influencing it. The reason I am doing this is that I have been reading a lot of comments recently on other news sites that had valid points on both Henning and Henne that I haven't thought of before. So, I am done talking, and now I want you to let me know what you think about them with your comments. I will try and put in my input in the comments. Thanks for reading, and let me hear it. You would think that a win against the Jets should be more satisfying than last Sunday's game actually was. Not only did the Dolphins defense stop the Jets consistently, but they were also able to force Mark Sanchez into making turnovers that led to points. Heck, without help from our defense, Miami wouldn't have scored a single point. That's the problem, though. The Miami Dolphins offense was so bad that they only gained 131 total yards against the Jets. What is worse is that Miami was only able to net for 30 passing yards. Numbers like that are embarrassing for any team, and they normally don't constitute a win. Thankfully, the Dolphins have one of the NFL's top defenses and were able to hold the Jets to 6 points while helping the offense get 10. This game reinforces everything I have been saying the past two weeks about Miami's offense: Chad Henne and Dan Henning need to go, and Ronnie Brown isn't what he used to be. After making everybody think that he was finally good enough to be a starter in the NFL with his performance against the Raiders, Chad Henne has just regressed to the same poor play that he has been doing his entire NFL career. He just can't make big things happen. He is too much of a robot, and he normally throws a bunch of turnovers. Turnovers weren't a problem in this game, but that was because Miami ran the ball a lot. Dan Henning finally relied more on the running game than he did the passing game. I know that at the beginning of the season I said that the Dolphins would be better off if they threw more than they ran, but I was wrong. Chad Henne can't take the pressure of carrying the offense, so it is necessary for Miami to keep running the ball. Henning still isn't in the clear for finally relying on the running game, though. Any time your offense is only able to gain 131 net yards, there has to be something wrong with your offensive coordinator. There is no excuse for such a poor offensive performance, and this should be yet another eye-opener for Stephen Ross that Dan Henning needs to go after this year. Henning also doesn't seem to know how to use Brandon Marshall. He has been pretty ineffective this year, and it isn't his fault. Yes, he has dropped a few passes, but he still isn't getting much of a chance to make plays at all. At least Marshall is going to stay longer than just this season, because he should be a lot better with a new offensive coordinator. I'll be honest, though, I don't want the Miami Dolphins to win another game this season. I want them to get a high enough draft pick for a potential franchise quarterback. I have been doing a little research, and Ryan Mallet of Arkansas is a quarterback that the Dolphins may have a shot at getting who I really want them to get. Thanks for reading, and please let me know what you think about our current offense and what needs to be changed. Also, I'd like to send a shout-out to my good Dolphins friend up in New York: Anthony. I know it was an ugly win, but at least you won't be hearing a bunch of trash-talking Jets fans all week. The Miami Dolphins defense put the team on their backs and led Miami to a 10-6 victory over the New York Jets. Sean Smith had a really great game against Mark Sanchez with a bunch of deflected passes. If he were able to catch a football, he would have probably returned three interceptions for the touchdowns. He had countless opportunities to intercept passes by Mark Sanchez, but was unable to bring in a single one. I will not complain, though, because he did his job well and prevented the man he was covering from catching the ball almost every time it was thrown in his direction. Cameron Wake also had two huge sacks on the Jets last drive. Not only did he help the Dolphins win the game with those two sacks, he also vaulted into the lead for the most sacks in the NFL with 14. Wake continues to show the Miami Dolphins how important he is, and I believe he deserves a nice, fat contract extension during the off-season. Chad Henne didn't do anything special with 55 passing yards, going 5 completions off of 18 attempts. He did throw a touchdown to Brandon Marshall, but that wasn't the most important thing he was able to do. The most important thing was that he didn't throw an interception, which was a huge part of the win. Thankfully, Miami's running game was able to do their part of the work on offense. Ronnie Brown had 55 yards off 16 carries and Ricky Williams ran the ball 10 times for 34 yards. Those aren't impressive numbers, but at least the Dolphins didn't become one-dimensional and just throw the ball. The Dolphins offense gained a combined 131 yards from scrimmage, which reinforces my belief that we need to get rid of Dan Henning at the end of this year. He just can't make the offense work, so Miami needs to bring somebody new in that knows how to use his weapons. Brandon Marshall still didn't do much against the Jets despite his touchdown. He only had two receptions for 16 yards, but he dropped a few passes that hit his hands. I am not sure what is wrong, but it apparently isn't entirely Dan Henning or Chad Henne's fault. Henning and Henne are both a big reason for Marshall's poor play this year, but it doesn't look like they are the only reasons. I'm not worried about Marshall, though. Once Miami gets a new offensive coordinator and quarterback, he should still be fine. For anyone who supports Chad Henne or Dan Henning, this game proves to you that neither person deserves to be a part of the Miami Dolphins next year. Getting a win against them is always satisfying, though. It doesn't matter how it happens. I don't know who the person is, but there is speculation that they are on the practice squad. Thanks for reading, and please leave a comment with your thoughts on the game. The season has officially ended for Brian Hartline, who was placed on the injured reserve Saturday. Hartline injured one of his fingers during the Miami Dolphins loss to the Cleveland Browns last Sunday. Hartline had surgery on the finger earlier this week, and the Dolphins finally decided to place him on IR. Hartline has had the best season of his young career after just the first 12 games, and he will be missed for the remainder of this season. The Dolphins better hope that Brandon Marshall is ready to play this week (and he likely will), because if he isn't then Miami's prime receiver will be Davone Bess. That isn't good because, while Bess is an extremely good receiver, he thrives when defenses are focusing more of their attention on another receiver like Marshall. 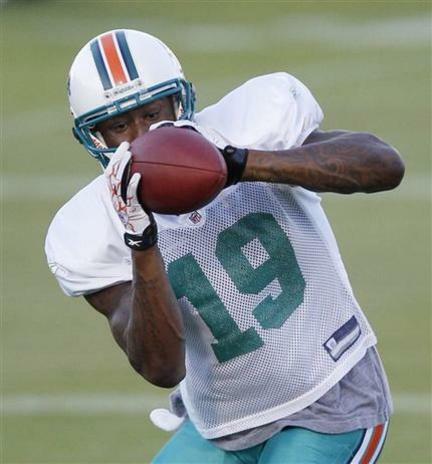 With the extra spot on the roster, Miami added tight end Dedrick Epps from the practice squad. We will see what the offense is able to do without Hartline. I wouldn't be surprised if RB Patrick Cobbs sees a couple more catches. I know he isn't a receiver, but Tony Sparano loves Cobbs and uses him a lot as a receiver. Thanks for reading, and let me know what you think the loss of Hartline will do to the offense. All indications out of Miami about Brandon Marshall are that he will be ready to play for the Miami Dolphins on Sunday against the Jets. Now that he is back in, we will see how well Chad Henne is able to do with the help of his top receiver. I have read a lot of people's comments saying that a big reason for Henne's poor performance last week was that he didn't have his top receivers in. While that reasoning would normally make sense, it doesn't apply here because Chad Henne threw the interceptions, not his receivers. An inaccurate passes to Brandon Marshall will have the same result as the same inaccurate pass to a high school receiver. If the quarterback can't throw the ball on target, it doesn't matter who he is throwing to. With that being said, maybe Chad Henne will do better with Brandon Marshall in. Marshall is a dynamic receiver, and he can make things happen. He is good at gaining separation, which can be helpful for an inaccurate Henne. We need to hope that Marshall will be able to get a bunch of separation from his defender, and that way, if Chad Henne throws the ball with poor accuracy, Marshall will be far enough away from the defender that he doesn't intercept it. That will be tough against a good defender like Darrelle Revis, but it needs to happen if the Miami Dolphins want to win. I almost don't want Chad Henne to do well against the Jets. As much as I want the Dolphins to win, I don't want them to get the idea that Chad Henne should remain the starter. I would prefer that they win on defense, special teams, and running the ball. Chad Henne isn't the answer to the Miami Dolphins quarterback question, and there are a few draft and free agent prospects that can easily outperform him. I want the Dolphins to go after those players and not stick with Henne. Thanks for reading, and let me know what you think about anything I said today. Another season is nearing its conclusion for the Miami Dolphins. Instead of going to the playoffs, they are instead preparing for another long offseason. We can discuss the multitude of reasons for such a poor season, but the fact of the matter is that the Dolphins won't be in the playoffs. I would rather that Miami tanks the rest of the season, honestly. Instead of winning for no reason, why not lose to get a better spot in the draft? They aren't going to do that, but they would be much better off if they did. 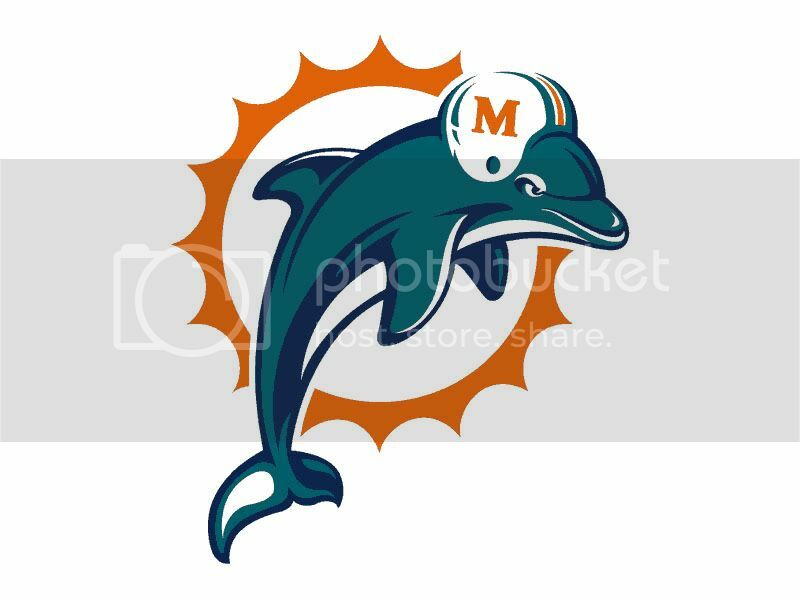 The only game that I want the Miami Dolphins to try and win this year is this week's game against the New York Jets. I would love nothing more than to shut Rex Ryan up once more. It would leave us with something good to remember from this season after almost everything else was a disappointment. So, actually, I don't want the Dolphins to tank the rest of the season. I want them to at least beat the Jets, and then tank the rest. This week may be the best week to play the Jets, too. They were just exposed badly on Monday night against the Patriots, and while the Dolphins aren't close to the Patriots anymore, at least we know they have a good shot against the Jets. Mark Sanchez looked almost as bad as Chad Henne looked against the Browns, and if the Dolphins secondary is able to catch the ball they should have a chance at disrupting Sanchez like the Patriots did. The key will be stopping TE Dustin Keller. He ran all over the Dolphins earlier in the year, and Miami hasn't shown any improvement this year when it comes to covering tight ends. This is purely hypothetical, but maybe Tony Sparano is starting Chad Henne for just this week's game because he wants to beat the Jets. While I do believe that Tyler Thigpen would be a better choice at starter right now, Henne knows the offense better than Thigpen, and he has experience playing against the Jets. I know this likely isn't Tony Sparano's motive for playing Henne, but I wish it were. I would love nothing more than for the Dolphins to head into New York and stuff a loss in Rex Ryan's mouth. He has been relatively silent since the loss to the Patriots, so imagine how little he would talk if he lost to the Dolphins. He buried the game ball from the New England game, so he would probably have to blow up the game ball from this week's game if Miami wins. Thanks for reading, and let me know what you think about "tanking" the season. Anyways, Brandon Marshall appears to be planning to stay in Miami for a long time. He just bought a home worth more than $4 million in Miami. This is a good sign that Marshall is planning on staying in Miami for a while. Despite his average season, he doesn't appear to be frustrated enough to want out of Miami, so at least we can rest easy about that for a few years. Normally, a player buying a new home isn't that important to a team, but this is pretty significant for the Dolphins. There hasn't been any mention of Marshall wanting out, but I was concerned we would hear something before the season was over. Brandon's new house soothes those concerns, though, and I can go back to the discussion of the more pressing situation for the Miami Dolphins: Chad Henne. Thanks for reading, and please be sure to return to the important discussion here. Tony Sparano indicated during an interview that the Miami Dolphins would evaluate their quarterback position at the end of the year, and he said that Chad Henne would remain the starter for the rest of this season. Now, I don't normally disagree with Tony Sparano, but I couldn't disagree with him more on this move. I don't see any benefit of starting Chad Henne anymore. He is not going to be the Miami Dolphins quarterback of the future. We have already found that out. Instead, he is just another failed experiment at quarterback for the Miami Dolphins since Dan Marino. Why wouldn't Miami just put Tyler Thigpen in for the rest of the year and see what he is able to do? This season is already shot; we have pretty much established that. So, why wouldn't the Dolphins try and find out if Thigpen is the quarterback of the future. Not that I am saying he is, but it is still worth a try. Starting Henne isn't going to make things any better, and Thigpen has a lot of potential, so why not give put him in there and see if he is capable of winning? In saying that he is going to start Henne for the rest of the year, Tony Sparano is basically admitting that he isn't willing to admit that he messed up with Henne. Instead of putting somebody with a chance to help Miami for the future, Sparano is showing stubbornness by keeping in his "Prodigal Quarterback" who was supposed to save the team from years of mediocrity. I just can't fathom why Sparano would bother keeping Chad in. He isn't accurate enough to be an NFL quarterback, period. He was surrounded by a bunch of really, really talented play makers, and still wasn't able to be successful. He has had plenty of time to show signs of development, but his improvement has been minimal at best. The only time that he really showed improvement was against the Raiders, and I think that may have been because the Raiders were playing bad; not because Henne was playing good. Let's hope Sparano realizes he should put Thigpen in instead. It could potentially help the Miami Dolphins a lot more than in the long run. Thanks for reading, and please let me know what you're thinking about this situation with a comment. The Miami Dolphins need to find a new starting quarterback to replace Chad Henne. I would have wanted to announce the above after, say, Chad Henne announced his retirement after a long, Hall of Fame career with the Miami Dolphins. Maybe it would have been after a huge Super Bowl victory, and Henne would have held a teary press conference saying that he was hanging his jersey up for the last time. That would have been the ideal situation, but it is not the real situation. Instead, it appears that Chad Henne is going to be benched for the final time in Miami because of poor, inconsistent play. Nobody in Miami has officially said that they are looking for a new QB, but there is no way they can be willing to keep Chad Henne after his embarrassing performance against a mediocre Cleveland Browns defense. His inaccuracy was evident, and in one game he turned me from being one of his biggest supporters into one of his biggest doubters. I have constantly supported Henne this year through his ups and downs, but I just can't do it anymore. He's showed hardly any signs of improvement, and it is getting old watching him throw interception after interception. I really thought that he would be able to develop his accuracy and passing skills this year, which is why I was able to stay patient with him, but he has seemed to have only gotten worse. He has size and arm strength like some of the best quarterbacks in the NFL, but his accuracy has to be among the worst in the NFL, and he makes way too many mental errors. So much for Chad Henne going "down as the greatest quarterback in Miami Dolphins history." Sorry Stephen Ross, but he isn't going to be anywhere near Dan Marino or any of the other Dolphin greats at quarterback. Instead, he is just another player added to the long list of failed quarterbacks the Dolphins have started since Dan Marino's retirement. Now, Miami must begin looking for a new quarterback to, hopefully, lead the Dolphins to great things. Backup Tyler Thigpen may be able to do well, but I am not so sure about him. He showed flashes of greatness against the Titans three weeks ago, but I am not sure how good he is at throwing from the pocket anymore. He does play similar to Michael Vick in that he can run the ball well, but he doesn't pass nearly as well as Vick. Thigpen still has a pretty good arm, but I am not sure if it is good enough for the NFL or not. If I were calling the shots in Miami I would put Thigpen in as the starter for the rest of the season. The season is already over, and now the Dolphins should just focus on finding out if Thigpen can start and play well in the NFL. He may very well be a great starter in the NFL. The Dolphins might as well try him out and see if he can be successful. If he can't, then they should start to look for somebody in the free agent market or the draft. I don't know how likely it is that he will be available, but if Michael Vick is available the Dolphins must be willing to pay him whatever he wants to come play in Miami. I don't care if they pay him $50 million guaranteed as long as they get him in a Miami Dolphins jersey. Stephen Ross can cut Chad Henne so Vick can get his #7, and then sit back as Vick runs and throws the ball past every defense in the NFL. There aren't many other free agent quarterbacks that would be worth getting, so the Dolphins would need to look to the draft if they can't get Vick. I don't know much about the incoming draft class and what quarterbacks would be available, but I guess I will be doing some research on that now. I know that Cam Newton would be a good player to build the team around. He can run the ball really well, is very strong, and has a pretty good arm. The problem is that he is a junior, and I am not sure whether he will declare for the draft this year or not. Andrew Luck of Stanford and Jake Locker of Washington will probably already be taken in the draft when the Dolphins have their pick, but Miami would probably have a shot at Ryan Mallett from Arkansas. From what I can tell, though, Mallett is way too similar to Chad Henne. He is a big quarterback with a strong arm and average accuracy. I am going to do more research, but I am not so sure I want him starting under center in Miami next year. We will see how everything plays out. I know you are all frustrated that Henne is done, and so am I, but we must start to look to the future. We still have an extremely talented team. We just need a quarterback to help this team accomplish what it is capable of. Throughout this season I have been a big Henne supporter despite his pretty poor performance. That is until now, though. It was extremely frustrating watching Henne play today. A week after he looked so good against the Raiders he threw for three interceptions and was unable to do much of anything against a mediocre Browns defense. His first two interceptions were entirely his fault. The first pick he threw was terribly under thrown, and turned a potential Brian Hartline touchdown into a turnover. His next interception was in Davone Bess' direction and was way too high. His third pick was tipped, so it wasn't exactly his fault, but that was the only time he got off easy from a mistake. What really frustrates me is that the rest of the Miami Dolphins team held up their end of the bargain, and that this loss was entirely on Chad Henne. The Dolphins defense had a little trouble covering the Browns TE Benjamin Watson, but other than Watson they were able to put Miami in a position to win. Chad Henne just couldn't capitalize. I hate that Henne has been such a disappointment this year. I really thought that he would be the quarterback we have been looking for since Marino, but I just can't see it in him anymore. He has way too many turnovers, and he just doesn't have the accuracy necessary to hit his receivers at any distance. I think it is time to put Tyler Thigpen in the game and let him finish out the rest of the season. This season is over, and I think the Miami Dolphins should spend the rest of this year trying to figure out if Thigpen is who they are looking for. Thanks for reading, and I'm sorry to anyone who I gave false hope about how well Henne would do this year. I am just as disappointed as you all. The Cleveland Browns are coming into town this Sunday to play against the Miami Dolphins, and if Miami wants to win then they need to focus on shutting Browns RB Peyton Hillis down. The Browns do not have much of a passing game at all. Their top pass catchers, Peyton Hillis and TE Benjamin Watson, aren't even wide receivers. Cleveland has done so poorly this year because they don't have any consistent threats at receiver, which is the main reason they have had to rely on Peyton Hillis so much. Therefore, if the Miami Dolphins want to beat Cleveland, they will have to focus on stopping Hillis. The Dolphins defense has had to play a lot of supremely talented running backs this year like Adrian Peterson, Chris Johnson, and Ray Rice, so it isn't like they don't have experience against top running talent. Those arms are scary, and they just prove how powerful he is. Just imagine trying to tackle him, but that is what the Miami Dolphins defense will need to do if they want to win the game. Hillis has really broken out this year. Last year he only had 54 rushing yards, but this year he has more touchdowns than every running back in the NFL except for one, and has the ninth most rushing yards. I am actually pretty concerned about how well the Dolphins will be able to stop Hillis on Sunday. Miami has had certain games this year where they just couldn't wrap up the ball carrier, and I really hope this isn't going to be one of those games. Hillis has the ability to knock over almost any tackler, so it will be scary to see how many Dolphins tacklers he will be able to get past. I'm not saying that the Dolphins defense is terrible at tackling, but they do seem to have moments where they can't wrap up the man with the ball to save their lives. Thanks for reading, and please comment and let me know what you think Hillis will be able to do against the Dolphins defense. I'll talk to you guys after the Dolphins come out with a win. You may not realize it, but the Miami Dolphins defense is ranked as one of the top defenses in the NFL. They have allowed the 10th lowest amount of points, 6th lowest total yards per game, and 4th lowest passing yards per game. Their record doesn't really reflect the tremendous amount of talent on Miami's defense, but they are still one of the best. The number that the Dolphins defense should be most proud of is the 4th lowest passing yards per game. They have only allowed 201.4 passing yards per game this season, and they have been able to do so with a very young secondary. The Miami Dolphins haven't done so well stopping the passing game thanks to just one or two players. While players like Vontae Davis and Yeremiah Bell have been able to dominate, they haven't had to do it alone. Nine different Dolphins have gotten an interception this season, and that isn't counting Jason Allen who plays for the Texans now. Miami's secondary still has its moments where they make mental mistakes and allow a big gain, but I have noticed those mistakes have significantly decreased as this season has progressed. This defense will only get better with time, too. The average age of the Dolphins starting cornerbacks and safeties is 25.5 years old. If you don't include 32-year old Yeremiah Bell, then their average age is just 23.3 years old. We have a very talented and young secondary that, with the exception of Yeremiah Bell, has a long and promising future ahead of them with the Miami Dolphins. The Dolphins run defense has also been pretty good. The Dolphins have allowed the 14th lowest rushing yards per game, and that is including games against the likes of Adrian Peterson and Chris Johnson. Mike Nolan has really put together a talented defense, and we should all be very thankful that the Dolphins hired him as the defensive coordinator. He turned a very bad defense into a top-tier passing defense in just one offseason, and that is not easy to do. I would also like to put a little shout-out to Cameron Wake, who is really taking the NFL by storm with his ability to get to the quarterback. He has 10.5 sacks and is has the second most sacks in the NFL. He is just one sack behind first place Clay Matthews, and he has the more sacks than any other player in the NFC. It's hard to imagine that last year Wake didn't even play that frequently when he is able to do so much when he is on the field. Thanks for reading, and I look forward to hearing your responses. Brandon Marshall Returns To Practice, But Does He Actually Hurt The Miami Dolphins Passing Offense? Brandon Marshall (hamstring) returned to practice on Wednesday and is expected to play this Sunday against the Browns. Marshall has not produced nearly as much as many Miami Dolphins fans had hoped he would this season, but I would argue that his low scoring numbers are mainly the fault of Dan Henning. He has gotten a lot of receptions and yards, but has only been able to reach the end zone once this season. He has also had two dumb penalties for delay of game and taunting, and his frustration is becoming more and more evident as the season progresses. What I want to know is does he actually help the Miami Dolphins more than he hurts them? My answer is yes, he does help a lot more than he hurts. While the Dolphins were able to have one of their best overall passing games with Chad Henne at quarterback last Sunday and without Brandon Marshall, that doesn't mean Marshall is the problem. Miami was able to do so well partly because the Raiders don't really have a good passing defense, and (more importantly) Dan Henning was finally willing to change up his play calling. I am firmly convinced that Brandon Marshall's inability to score touchdowns is 100% Dan Henning's fault. Henning focused the Dolphins entire offensive strategy on getting Brandon Marshall the ball. That may not sound like a bad idea because Marshall is such a play maker, but focusing entirely on just getting one player the ball makes the offense way too predictable and makes Marshall almost useless because defense start to put double and triple coverage on him. If the Dolphins want to be able to use Marshall effectively and get him more touchdowns they needed to learn how to spread the ball around a little more. They needed to become more like the Saints passing offense. Drew Brees spreads the ball out to so many different receivers that defenses have a hard time stopping him. The Dolphins showed me a little bit last week when Chad Henne was able to get the ball to a lot of different receivers. Seven different players caught at least one pass against the Raiders, and the two receivers with the most receptions and yards for Miami (Davone Bess and Brian Hartline) didn't even catch a passing touchdown. That tells you how much the Dolphins were able to spread the ball around. That may not be a good sign for fantasy football owners, but that shouldn't matter. What matters is the Miami Dolphins winning games. I think last Sunday's game was exactly what the Dolphins needed. Dan Henning saw what the offense was able to do by spreading the ball around without Brandon Marshall. Imagine how well they can do if they continue to spread it out with him in the game. He won't see as much double coverage, and he probably won't see any triple coverage at all because there will be other receivers that pose as a legitimate threat to defenses. Pair all of the receiving threats with the Dolphins talented running backs, and you have a lot of playmakers that are finally being put to good use. Dan Henning needed a good game like this to see what the offense is capable of if he uses all of its playmakers. I have a good feeling about Brandon Marshall's future with the Miami Dolphins. Dan Henning should know how to use him correctly now, and I am hoping he will be able to. Thanks for reading, and please feel free to leave a comment with your thoughts on Marshall. We are paying him a lot of money, and I am interested to see opinions from Dolphins fans about his performance so far. The Miami Dolphins players need your help to get into the Pro Bowl. You can vote as many times as you would like, and you don't have to vote for every position. You can also just vote for Dolphins players by clicking the drop down arrow next to "All Teams" and selecting Miami Dolphins. I do not know who the leaders are in each position, but we need to make sure players like Vontae Davis and Lousaka Polite make it in even though they aren't household names yet. Don't even bother leaving a comment, just go to the link above and vote for every Dolphins player at least three times. We will have a bigger impact than you think. Thanks for reading, now get to it.